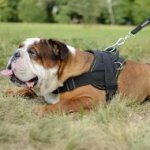 If your Bulldog pulls on the leash or refuses to run your commands, a choke collar is needed to correct its behavior. Remember that a choker is not used for obedience training to make it easier for you. 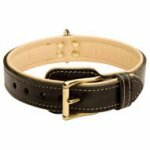 This type of collar serves for behavioral issues correction, such as leash pulling, stop jumping or attacking people and animals while outings. Choke collars are also in wide use for dog shows. They don't draw attention away from Bulldog's exterior. 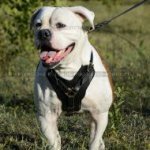 How does choke collar work? 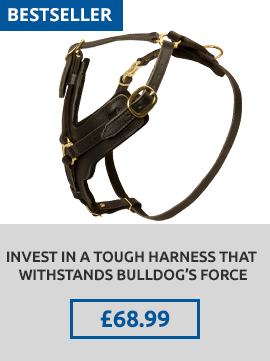 It is a loop, which is tightened around Bulldog's neck when its pulls or you jerk a lead. A loose ring which is at one end of the collar slides along and tighten the collar. A fixed ring is for leash attachment. 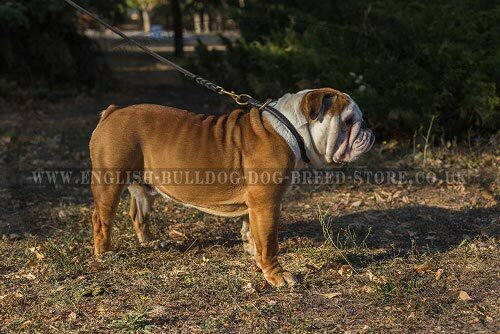 The collar won't act and it will be loosen if your Bulldog walks calm and doesn't pull. Choke collar is also used as a usual walking attribute when the lead is connected with the loose ring. There are choke chains of various metals and alloys and collars of one, round or two-ply leather. 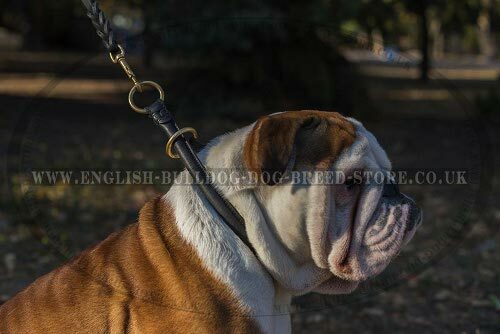 Chain with small links is suitable for medium Bulldog and the collar with large links - for large and strong Bulldog. Choke collar for Bulldogs of natural leather is nice to the feel, presentable and silent in action. 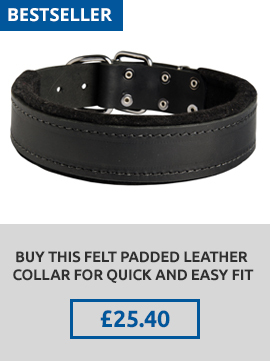 The collar is very comfortable and keeps the dog's coat in perfect condition. Leather is pleasant to wear in any season. It doesn't overheat in the sun and doesn't become too cold in frosty weather. Full grain natural leather contains no harmful impurities. Leather strap is manually selected and well-processed. It is durable, tearproof, but flexible and soft. 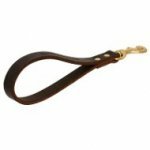 Genuine leather is perfect for Bulldogs with sensitive or allergic skin. It doesn't cause any discomfort, rubbing or cutting into the dog's neck because the edges are polished and waxed. It is recommended to oil the collar with special softcare leather balsam to save its look, to prolong service life and to protect from wet and water. 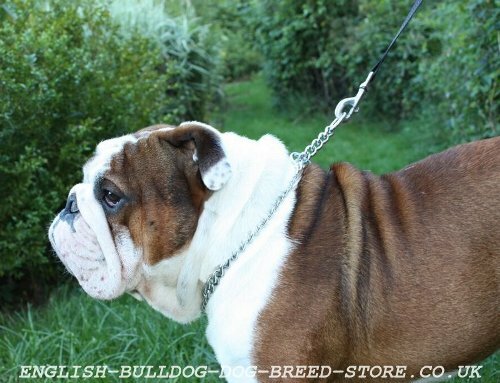 English Bulldog choke collar of metal is glossy and nice-looking. It is in demand for dog shows. The chain won't damage Bulldog's hair as each link is highly-polished. All the parts of the collar are weld and break-resistant. Chrome-plated steel is the material the collar is made of. The chain is protected with double coating: nickel first and then chromizing to provide maximum protection against corrosion. Easy glide, reliability in use and safety are the advantages of this collar. 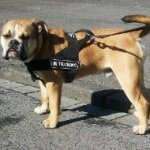 The collar is suitable for medium and large Bulldogs. It will provide efficient and harmless corrective training. The action of chokers is based on natural instincts when the mother-dog brings up her puppies. 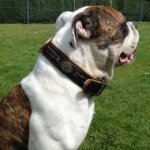 Use choke collar properly and it won't do any harm to your Bulldog. 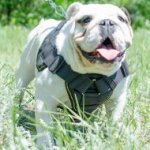 Choke collar doesn't suit for Bulldog puppy under 6 months. It can hurt its neck and trachea. Chokers are pulled over the dog's head and you have to measure Bulldog's head and neck circumference in the widest parts (below ears and a jaw line). Compare head and neck sizes and add 2-3 inches to the bigger size to specify corresponding length of the chain collar. 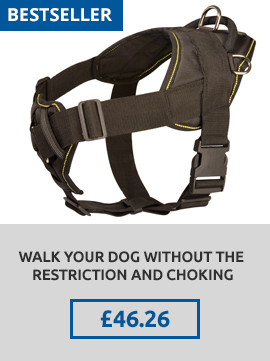 Choke collars are not used for daily walking. Don't jerk the leash during Bulldog training because this will tighten the collar too much and may hurt the dog. Your aim is to show Bulldog that the direction of moving is changed by you. Walk with measured steps and hold the lead closer to the choker. Change your direction suddenly. The leash is tensed and Bulldog will feel discomfort. Loose the lead and reward the dog in words, with stroking or a treat. Do not leave your Bulldog alone with the choke collar on. 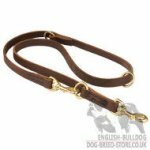 Ask advice of experienced dog trainer before chocker purchasing. Use the collar under trainer's control if required. Do you have any questions? Please, write us and we will reply to them! 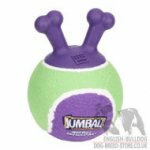 Bulldog Dog Toy Ball of Rubber with Handle "Jumball"